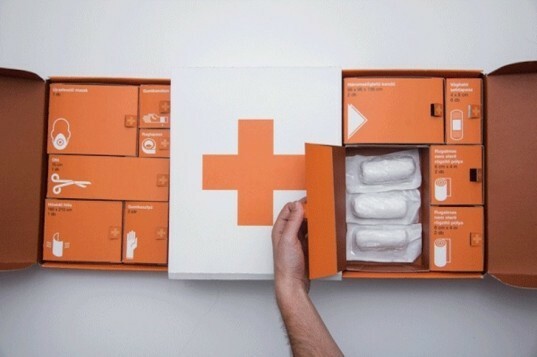 Can a better-designed first aid kit help save lives? 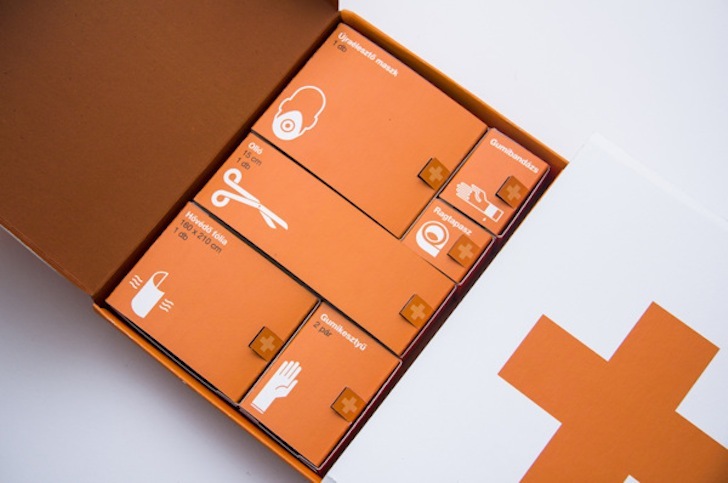 Hungarian designer Kevin Harald Campean has revamped the typically haphazard first aid kit into a stylish new toolkit reminiscent of packaging by Apple. Campean’s new design features a bold orange makeover that uses simple, streamlined design for easier use in emergency situations. Designed for his final thesis project, Campean’s new packaging is emblazoned with an orange cross with the European emergency number 112 inscribed in the lower right corner. Seeking to reduce clutter, he introduces a new organizational layout that uses visual cues to compartmentalize each medical tool, making use of the first aid kit incredibly intuitive even for non-Hungarian speakers. To access the tools, the user slides the two bright orange kits out from each side. The left kit holds the medical tools and the right contains various bandages and gauzes. Each kit is divided into smaller compartments with white pictograms–icons that convey meaning through visual representation–with easy-to-lift tabs. Since Campean designed the sleek aid kit for a university project, however, it is not known if he will try and bring the design to market. Campean introduces a new organizational layout that uses visual cues to compartmentalize each medical tool, making use of the first aid kit incredibly intuitive even for non-Hungarian speakers. First aid kits are typically haphazardly organized. Concept sketches for how the first aid kit would be packaged. Designed for his final thesis project, Campean’s new packaging is emblazoned with an orange cross with the European emergency number 112 inscribed in the lower right corner. Simple diagrams for using the kit are printed on the back of the box. To access the tools, the user slides the two bright orange kits out from each side. The left kit holds the medical tools and the right contains various bandages and gauzes. Each kit is divided into smaller compartments with white pictograms--icons that convey meaning through visual representation--with easy-to-lift tabs. Since Campean designed the sleek aid kit for a university project, however, it is not known if he will try and bring the design to market.